‘It was during my 4th year of my Sociology and Education degree at Universidad Distrital in Colombia when I decided to become a volunteer. I was experienced in working on social projects among different communities across Colombia, most of which related to developing workshops for young people, and these helped me to realise how rewarding and profitable it would be to then do some voluntary work abroad. Once I got involved with the North Lanarkshire Befriending Project I became aware how necessary our help is. This project offers young people social and emotional support hidden in some basic activities such as swimming or bowling. These activities are, however, just a small part of a long term process of building up a trusting relationship between an adult and a child – something that some of these children may not have at home. I started volunteering without realising that it would be a long process of getting to know every child that I was paired with. It would seem, from what I have witnessed, that it is rare that some of these children have the chance to share their worries, complaints or needs with an adult who is willing to listen. One week after another I could see that they became more confident, not only with themselves, but with me. I really appreciate that, it couldn’t have been easy for them to instantly trust a new person like myself; someone that they’d only met once before who then came through their door, speaking with a foreign accent, using words that they didn’t understand and then asking them about their life. acting with other kids. 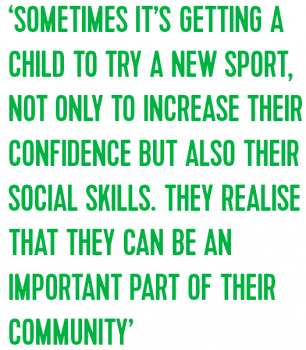 Sometimes it’s getting a child to try a new sport, not only to increase their confidence but also their social skills. From doing these things, they realise that they can be an important part of their community. Whilst I’ve been part of North Lanarkshire befriending project I have developed skills in working with young people with autism and increased my understanding of their behaviour and needs. It wouldn’t have been possible without a constant support and feedback from the NLBP managers, two experienced people that have always shared their experience and knowledge to encourage me and keep up this process.